We are a grass root non-profit society based in Vancouver BC with the following objectives:. 1. To uphold the Christian faith in the kingdom of God as the progressive extension of God's redemptive reign throughout the whole creation by a reconciled community. 2. To promote and foster the reconciliation of Canada’s relationship with the indigenous people and nations. 3. To research or facilitate the research, publication and teaching of the missing pages about various minority communities in the history of British Columbia. What gave birth to CFR? Chinese Christians In Action Society was founded in 1989 to express its support for the student’s democratic movement in China. In 1990, the Oka crisis in Quebec forced some of us to think if we were concerned about the ones crushed at Tiananmen Square, shouldn’t we be concerned about those aboriginals to be crushed at Oka? That initiated a movement to find the theological basis as well as earthly ways for caring of the world, as those topics were by and large missing in Chinese church teachings. Among our subsequent areas of engagement, the one with native people led to improved public understanding of their plight in Canada. By 2001, we have witnessed so many major conflicts with aboriginals in Canada that we were convinced reconciliation with the aboriginal deserved a focused treatment and CFR was born in September. We have hosted many aboriginal speakers in many public forums with aboriginal speakers. We have organized many bus trips up to native reserves in an attempt to create dialogues and understanding. Over the years, about 1500 has journeyed with us on the road to reconciliation. In 2004, we held the Historic Banquet, a truly historic event attended by 600 aboriginal, Chinese and non-Chinese Canadians. 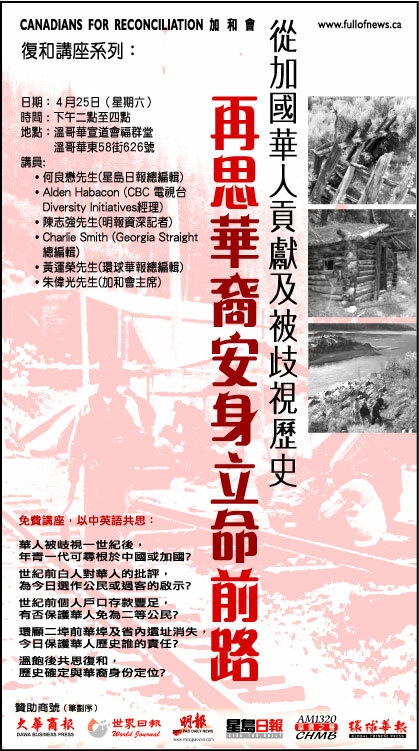 In 2008, with the help of aboriginal friends, we initiated the journey to recover the missing pages of BC’s history pertaining to Chinese Canadians. Six physical journeys were made into the Fraser Canyon which led to the rediscovery of many burial, mining, camping and habitat sites. In 2009, we expressed concern over the proposed reconstruction of New Westminster Secondary School currently built over a Chinese cemetery. A forum was organized in April to explore the future of Chinese Canadian identity. In 2005, our work with the aboriginals received an honorable mention in Canadian Race Relationship Foundation’s bi-annual Award of Excellence competition. In 2005, our president was named as one of the bright lights in Vancouver by Georgia Straight’s annual edition on Vancouver’s Best. In 2009, our president was honored to be invited to speak on “Our Shared History” at Union of BC Indian Chief’s Chief Council meeting. Grand chief Stewart Phillip, Grand chief Ed John, Chief Robert Shintah and Chief Shawn Atleo all spoke in support of CFR’s effort to locate the Chinese missing history in BC. We are thankful for the help given by many aboriginal in locating our historical sites, and are humbled by this major endorsement from the highest aboriginal leadership in the Province.